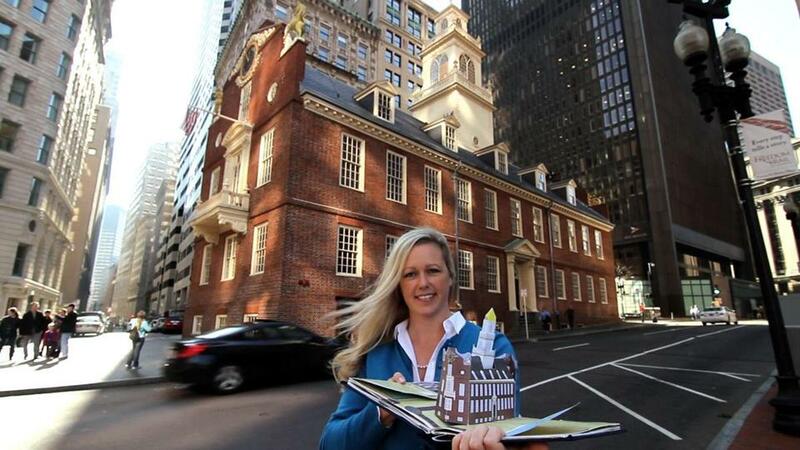 Denise D. Price holding her “Freedom Trail Pop Up Book of Boston” in front of the Old State House in Boston. The Freedom Trail often gets more love from out-of-towners than locals. Exhibit A is Denver transplant Denise D. Price, who taught herself how to engineer paper into three-dimensional structures so she could create WHAT SHE BELIEVES TO BE the first pop-up book about the HISTORIC ATTRACTION. Her “Freedom Trail Pop Up Book of Boston” (White Dharma) not only features 16 sites on the trail but is architecturally ACCURATE — down to the Doric, Ionic, and Corinthian columns of Faneuil Hall. The book is for children and adults, history buffs and art enthusiasts, and it pays special attention to the stories behind the five weathervanes atop historic buildings. Price, a real estate agent who lives in Cambridge, got the pop-up bug after walking the Freedom Trail when she moved here with her husband five and a half years ago. Eager to share her love of the path with her nieces and nephews, she scoured Boston shops for a pop-up book. “I thought the city really needed one,” she said in a recent phone interview. Coming up empty, she got to work. She taught herself how to “draw” and “paint” on a computer. In 45 days, she raised $52,500 on Kickstarter. She hired a printer in Vietnam and flew there to check on the assembly of the 5,000 books she ordered. On July 1 at 2 and 2:45 p.m., she will be teaching children, ages 6 and up, at the Old South Meeting House to craft their own pop-up structures. The workshop is free with museum admission. “If there were a prize for ornery old men, the ornithologist Jim Kennoway in Alice Greenway’s novel ‘The Bird Skinner’ would trounce every recluse in New England.” That sentence opened Joanna Hershon’s review in The New York Times and may help explain why “The Bird Skinner” (Atlantic Monthly) has been recognized by the New England Society of New York for best novel of the year. The society’s annual book awards honor New England culture. “Wide and Deep: Tales and Recollections from a Master Maine Fishing Guide” (Skyhorse) by Randy Spencer received the contemporary nonfiction award. The history and biography award went to “The Map Thief: The Gripping Story of an Esteemed Rare-Map Dealer Who Made Millions Stealing Priceless Maps” (Gotham) by Michael Blanding. “The New England Kitchen: Fresh Takes on Seasonal Recipes” (Rizzoli) by Jeremy Sewall and Erin Byers Murray is the winner of the specialty book award. In the late 19th century, schoolchildren memorized the poetry of Henry Wadsworth Longfellow and wrote scores of letters to him. Among the gifts from young fans in Cambridge was a chair built from the wood of the “spreading chestnut-tree” that Longfellow mentions in his poem “The Village Blacksmith.” An open house, featuring the chair and other gifts, is being held at the Longfellow House-Washington’s Headquarters National Historic Site in Cambridge from 4:30 to 6:30 p.m. Thursday. Sydelle Pearl, author of “Dear Mr. Longfellow: Letters To and From the Children’s Poet” (Prometheus) will speak at about 5:30 p.m.